In Microsoft Exchange we can set distribution group as restricted. Then this distribution group will only accept messages from specified users. We can set this settings in distribution group properties in tab Mail Flow Settings, Message Delivery Restrictions. 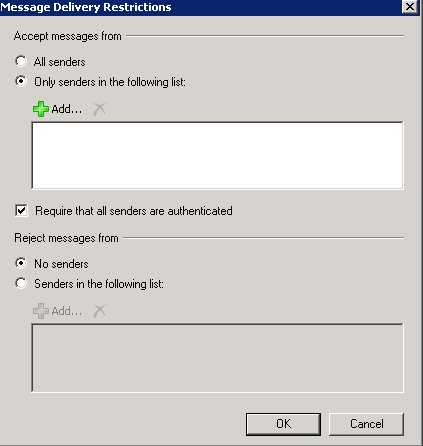 In section Accept messages from select Only senders in the following list and add all users who can send messages to this group. If we have many of distribution groups with restrictions and we need to assign send rights to this groups then we have a problem. To keep Exchange Distribution Groups in order, we recommend to “clean” members of those groups. We should remove all disabled users from distribution groups. When we have a lot of Distribution Group we can use powershell script like below to do this. This script gets all Distribution Groups from Exchange Organization, then will check every group for users which are disabled and they have Active Directory account in specified OU. When you have Active Directory Security Group which add permissions to some share or other resources, sometimes you need to send email to all group members to inform about some changes. You can choose all users from Security Group but what if this group has more than 100 users. You can create Exchange Dynamic Distribution Group. When you want to create Exchange Dynamic Distribution Group, and add all members of security group to this dynamic group, it’s not so easy. You can’t do this using Exchange Management Console.